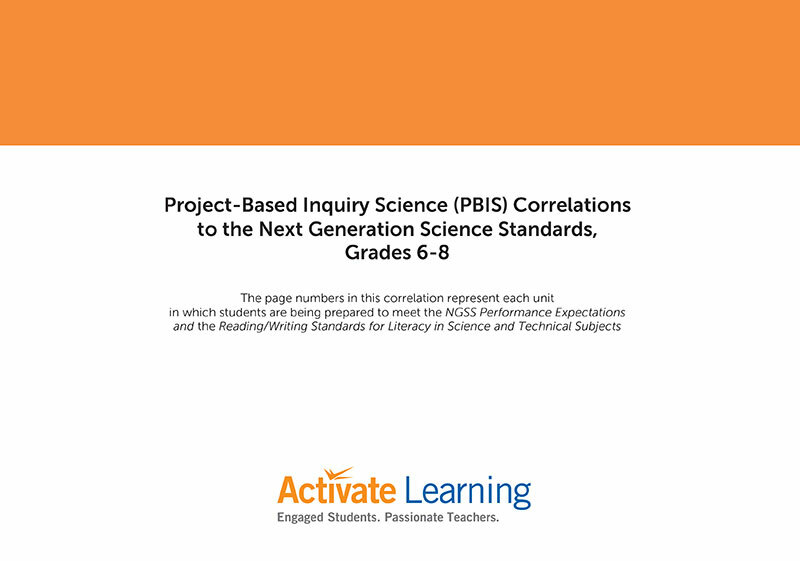 Project-Based Inquiry ScienceTM (PBIScience) is a 3-year middle-school curriculum designed to be taught as stand-alone units. You can teach by domain (Life, Physical, Earth and Space Science) or you can integrate the sciences each year. Based on research in the cognitive and learning sciences. Developed through rigorous, iterative, research-based cycles. Integrates science and engineering practices, crosscutting concepts, and core ideas. Big Questions and Big Challenges guide instruction and organize learning progressions. Collaborative groups engage in rigorous science discourse. Students design investigations, generate data, assess the trustworthiness of their data, make claims, and justify claims with evidence-based explanations. Solving an engineering problem: Students are presented with a realistic community scenario and a problem they need to address. Addressing an engineering design challenge: Students iteratively design, build, and test a device. Answering a Driving Question: Students answer a complex science question about a phenomenon that has real-world implications. Student Editions and educative Teacher Guides are available in print and digital formats. development, unit walkthrough, and setup videos. Video Introduction to PBIScience CyberPD. Total Support for Teaching PBIScience Successfully: Preparation, Just-in-Time Support, Reflection, and a Professional Learning Community. Big Question: How do scientists work together to solve problems? Students design an animal enclosure that allows animals to feed and communicate as they would in their natural habitat, and also allows scientists to make accurate observations of the animal. By addressing the challenge, students explore the practices of biologists, while learning such fundamental science principles as biological structures and functions, adaptations, and interdependence of living things. Big Question: How can knowledge of genetics help feed the world? Students provide advice about developing a rice plant that is nutritious and can be grown in places that do not get a lot of rain. After being introduced to the worldwide problem of food shortage, students investigate how to develop varieties of rice that could help to alleviate the shortage. Within this context, students learn sexual and asexual reproduction, Mendelian inheritance, Punnett squares, meiosis and mitosis, chromosomes and DNA, how traits and the environment interact, evolution and natural selection, variation, natural and artificial selection, and the promises and potential threats of genetic engineering. Big Question: How can you prevent your good friends from getting sick? Using the practices of epidemiologists, students collaborate to investigate communicable diseases and their affects on people. Students learn about bacteria and viruses that cause disease, cell structure and theory, levels of organization of living organisms, structure and function, interdependence of human body systems, and how to track a disease. Students use this information to develop a set of recommendations for staying healthy, and helping others stay healthy. Big Question: How does water quality affect the ecology of a community? Students give advice to a small river town about how to deal with a new industry that wants to move into the area. Using some of the practices and skills employed by ecologists, students learn about food chains and webs, ecosystems, biomes, photosynthesis and cell respiration, classification of living things, water quality and its effect on living organisms, and the effects of human activity on ecosystems. Within the context of Earth science, students explore variables, reliable procedures, fair tests, case studies, models and simulations, and use evidence to construct scientific explanations and make recommendations to answer the Big Question. Students explore and learn about such fundamental principles as matter, atoms, molecules, volume, density, erosion and deposition, volcanoes, and rocks and minerals. Big Question: How can you know if objects in space will collide? As part of exploring the potential for the impact of objects in space, students learn about evidence of collisions in the solar system, the components of the solar system (including the Sun, Earth, Earth’s Moon, other planets and their satellites, comets, and asteroids), the motion of those components, and the existence of other galaxies. Based on this understanding, students determine whether a fictional asteroid will hit Earth. Big Question: What processes within Earth cause geologic activity? Students use a variety of methods, including software, the Internet, and two-dimensional maps to observe differences in topography, and earthquake and volcano patterns. In the process, they learn about the structure of Earth, the theory of plate tectonics, interactions of Earth systems, and the history of Earth. Big Challenge: Write a plan for responding to a severe-weather event. Students explore how weather is measured, the difference between weather and climate, and the factors that affect the weather and climate in six different climatic regions of the United States. They discover that latitude, the tilt of Earth’s axis, and the proximity to large bodies of water affect surface temperatures. They investigate what causes precipitation, and in the process, they learn about the transfer of thermal energy, the water cycle, and effect of winds and ocean currents on weather and climate. Within a physical science context, students explore variables, reliable procedures, fair tests, and use evidence to construct explanations and make recommendations to answer the Big Question. Through a series of design challenges, students explore the practices of scientists and engineers, while learning about such fundamental physical science principles as mass, surface area, and forces. Big Question: How can you improve the air quality in your community? Through numerous investigations and case studies, students learn about the nature and composition of air and other matter, states of matter, atomic theory, bonding, the periodic table of the elements, and many other fundamental chemistry topics, as well as sources and effects of pollution. Students apply their knowledge by investigating the air quality in their own community and examining the sources, effects, and potential solutions to the pollution problems identified. Big Challenge: Design a Rube Goldberg machine to turn off the lights. In the process of addressing the challenge, students learn about the following types of energy: kinetic, elastic potential, gravitational potential, thermal, chemical, light, sound, and electrical. They also learn about energy indicators, and recognize that energy has the ability to do work or cause a change. They also learn about conservation of energy and renewable and nonrenewable energy sources. Big Question: How do machines help move large, heavy objects? Students respond to this Big Challenge: Lift a large heavy object—a crate—to the top of a cliff using a machine. They begin by investigating what makes things move and defining balanced and unbalanced forces. Through investigations, data collection, and analysis of several simple machines, students qualitatively define mechanical advantage. In the process they are introduced to Newton’s laws of motion and energy transformations. Big Challenge: Design and build a vehicle that will go straight, far, and fast, and carry a load. Students explore principles of motion and force, including relative motion, velocity, acceleration, Newton’s laws, friction, gravity, balanced and unbalanced forces, and net force. They use these principles to improve their design of two cars—one with and one without a propulsion system. A Regents’ Professor in the School of Interactive Computing in the Georgia Institute of Technology’s College of Computing. Since 1978, her research has focused on learning from experience, both in computers and in people. She pioneered the Artiﬁ cial Intelligence method called case-based reasoning, providing a way for computers to solve new problems based on their past experiences. Her book, Case-Based Reasoning, synthesizes work across the case-based reasoning research community from its inception to 1993. Since 1994, Dr. Kolodner has focused on the applications and implications of case-based reasoning for education. In her approach to science education, called Learning by Design™ (LBD), students learn science while pursuing design challenges. Dr. Kolodner has investigated how to create a culture of collaboration and rigorous science talk in classrooms, how to use a project challenge to promote focus on science content, and how students learn and develop when classrooms function as learning communities. Currently, Dr. Kolodner is investigating how to help young people come to think of themselves as scientific reasoners. Dr. Kolodner’s research results have been widely published, including in Cognitive Science, Design Studies, and the Journal of the Learning Sciences. Dr. Kolodner was founding Director of Georgia Tech’s EduTech Institute, served as coordinator of Georgia Tech’s Cognitive Science program for many years, and is founding Editor in Chief of the Journal of the Learning Sciences. She is a founder of the International Society for the Learning Sciences, and she served as its ﬁ rst Executive Ofﬁcer. She is a fellow of the American Association of Artiﬁcial Intelligence. Joe Krajcik has focused on working with science teachers to reform science teaching practices (3-Dimensional Learning) to promote students' learning of science. He was head of the The Next Generation Science Standards (NGSS) Physical Science Design team and led the Physical Science Design team for the Framework for K – 12 Science Education. Vice President for Education and Children’s Programs at the National Geographic Society. Previously, he was the director of the Geographic Data in Education (GEODE) Initiative at Northwestern University, where he led the development of Planetary Forecaster and Earth Systems and Processes. Since 1992, Dr. Edelson has directed a series of projects exploring the use of technology as a catalyst for reform in science education and has led the development of a number of software environments for education. These include My World GIS, a geographic information system for inquiry-based learning, and WorldWatcher, a data visualization and analysis system for gridded geographic data. Dr. Edelson is the author of the high school environmental science text, Investigations in Environmental Science: A Case-Based Approach to the Study of Environmental Systems. His research has been widely published, including in the Journal of the Learning Sciences, the Journal of Research on Science Teaching, Science Educator, and The Science Teacher. A Research Specialist in Science Education in the School of Education at the University of Michigan. She collaborates with teachers and students in elementary and middle school science classrooms around the United States who are implementing Project-Based Inquiry Science. Before joining the PBIScience team, Dr. Starr created professional learning experiences in science, math, and technology, designed to assist teachers in successfully changing their classroom practices to promote student learning from coherent inquiry experiences. She has developed instructional materials in several STEM areas, including nanoscale science education, has presented at national and regional teacher education and educational research meetings, and has served in a leadership role in the Michigan Science Education Leadership Association. Dr. Starr has authored articles and book chapters, and has worked to improve elementary science teacher preparation through teaching science courses for pre-service teachers and acting as a consultant in elementary science teacher preparation. As part of the PBIScience team, Dr. Starr has played a lead role in making units cohere as a curriculum, in developing the framework for PBIScience Teacher’s Planning Guides, and in developing teacher professional development experiences and materials.